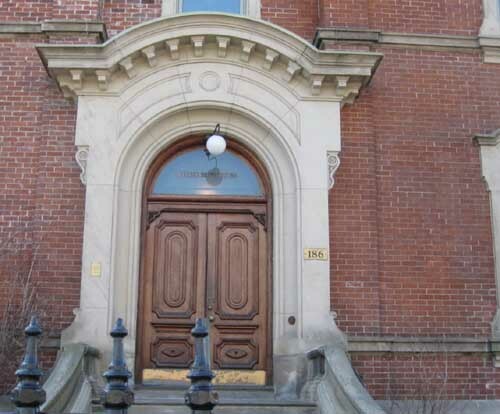 In February 2010 we had the privilege of going on-site at Toronto's George Brown House. Our witness worked as a journalist in an office in the building. While he had not experienced anything unusual himself, he had heard others had had some odd occurrences. Generally, it was believed that to be the ghost of Mr George Brown himself creating feelings of not being alone and perhaps causing lights to flicker. The George Brown House is approximately 9000 square feet and is owned by the Ontario Heritage Trust. The upper floors are leased as office space while the main floors are rented for conferences and other events. While we were there, there was a crew tearing down and cleaning up after a wedding the night before. We came into the basement from a side door and met before and after the investigation in a room which also houses the central dispatch for the steam heat. George Brown was the founder of the Globe newspaper and build this house from 1874-1876. He and his wife Anne and four children lived in the house until his death and named it Lambton Lodge. In March 1880 a disgruntled Globe employee shot Brown in the leg. The leg became infected and a few weeks later (May) he died in his home. His office in the restored house showcases his books in a beautiful glassed shelves; perhaps this is why some say his presence is felt most strongly in this room. In fact, investigator Scott S and I had simultaneous problems with our cameras in that room, even though he was using a 35mm camera and I a digital. Both cameras briefly lost battery charge at the same time. After George Brown died, the house was purchased by Duncan Coulson, his wife Eliza, and their three children. Coulson was the president of the Bank of Toronto and the family lived in the house from 1889-1916. They remodeled the dining room and it was this room I was particularly drawn to. I set up lasers and video tape but the only unusual thing was that one of my lasers refused to work in that room. It worked in every other room, but would not turn on in the dining room. The other two lasers worked perfectly throughout. Investigator John M set up extensive testing equipment for sound/EVP collection. The house has amazing acoustics and even normal conversation in the hall of the third floor was caught on regular tape downstairs in the dining room. This, along with the presence of the cleaning crew, made capturing EVP unlikely, but those recordings are still being studied. Architecturally, the building is a little disjointed. The architects were William Irving and Edward Hutchings, and it is designed with a primary hall and grand staircase plus a series of back stairs, probably for servants. The Heritage Trust has installed an elevator which is key operated and was not used the day we were there. The House is beautifully done with gorgeous lead windows and a fabulous stained glass one. A small addition to Brown's office houses a history display regarding the Globe newspaper. There were many issues with data collection in this House. The walls are four bricks thick, which should insulate well, but there are many large windows so outside sound and wind cannot be blocked entirely. Radiant steam heat throughout can certainly cause sounds that would be considered odd. There is a posted notice on the third floor that there is RF access in the ceiling—we can only suppose this is maybe transmitter and internet wiring. If someone has better information on what “access to RF” means please let us know. The house is on a corner, but it is a residential area and on this Sunday afternoon, the traffic was not heavy. Streetcars and subway are within just a few blocks. During his initial survey, John picked up Jamaican music on his headset and the witness and I clearly heard a helicopter overhead. Getting good data from this location will likely always be a challenge.